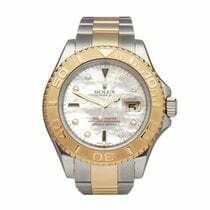 This is a pre-owned Rolex Yacht-Master rolesium platinum bezel men's 116622 watch. 40mm case size in stainless steel, blue dial on a stainless steel oyster bracelet, powered by a automatic movement. This Rolex is in excellent condition complete with box only. Circa 2010's. Our Xupes reference is W3737 should you need to quote this. THIS WATCH IS UNDER OFFER FOR A LIMITED TIME.